It's been a long autumn this year, an Indian summer they call it. Late October and no signs of any snow. In the twelve years we've been living here only one other Indian summer comes to mind. This sketch of a wonderful tree near the park was done a week ago. Oops! I spoke too soon. It's just now starting to snow outside. That sort of rain/snow mix and blustery wind. I was right to think it was the last week to enjoy the Fall colours. I'd never heard the term "strip mall" before we moved to Canada. Strip malls are neighbourhood shopping areas. Here in Edmonton they are typically a row of low shops, usually running round 3 sides of a parking lot. Always uninteresting in appearance, this one in our new neighbourhood of Ermineskine is especially unattractive. On looking closer however we found that besides the usual Chinese restaurant, dry cleaners, mom and pop store, the shops were unexpectedly "ethnic". There is the Hong Kong Taekwondo College, Shirdi Sai Baba Mondir Temple, Masjid An-Noor Muslim Community Centre, a Filipino Papa June's general store, with kitchen (not sure what that means as we didn't actually go into the shop). 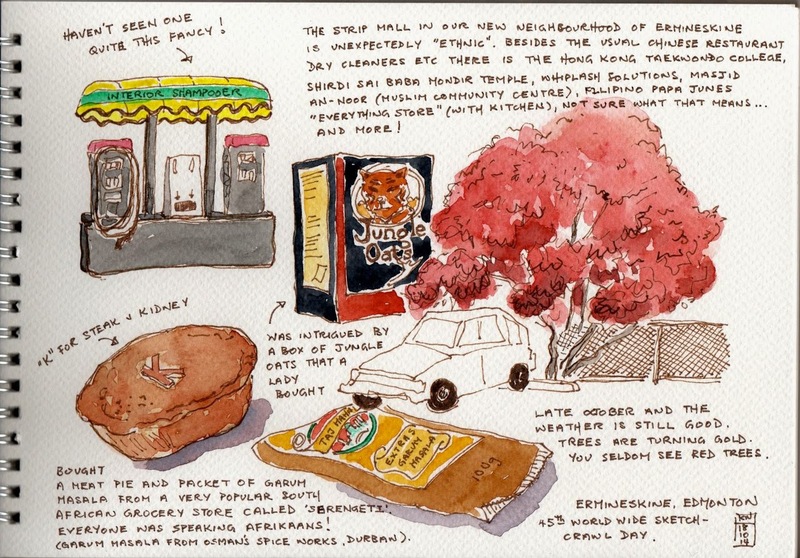 Further along, a shop called Serengeti turned out to be a lively South African grocery store run by a nice couple. It catered to both black and white customers and everyone was speaking Afrikaans! We bought a packet of Garum Masala (from Osman's Spice Works, Durban) which I'm sure will be better than the regular supermarket Garum Masala. We also bought two meat pies. 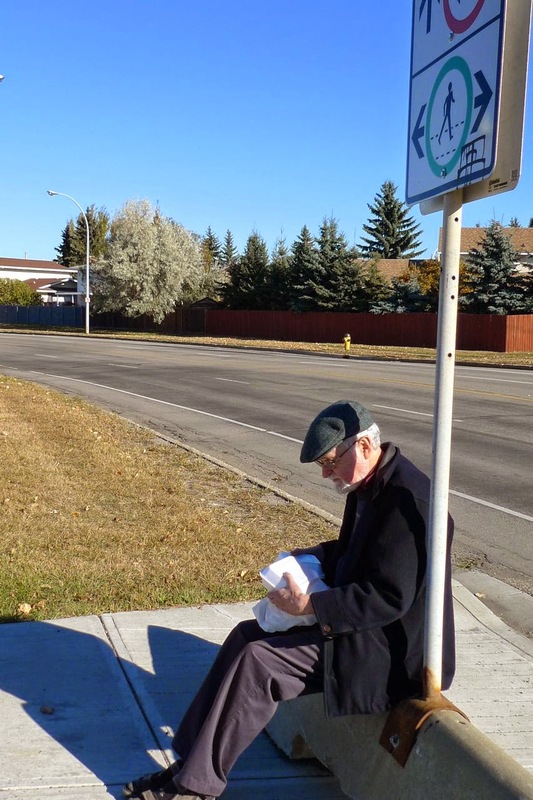 It's hard to resist what looks like a meat pie in Edmonton. These two we purchased (and ate in the street) were a steak and kidney and a beef and mushroom. Aside from the filling being a bit dry and the crust being somewhat oily on the base, they were perhaps the closest thing to an Aussie meat pie we'd had here in Canada. Waiting in the long line to pay for our pies I was intrigued by the box of Jungle Oats which a lady in front of us bought. Quick before the pies get cold. 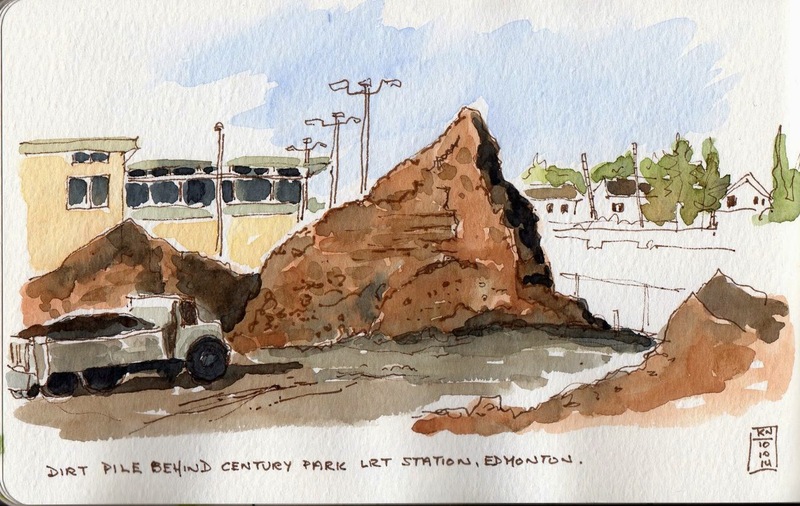 Has the dust settled at Century Park? 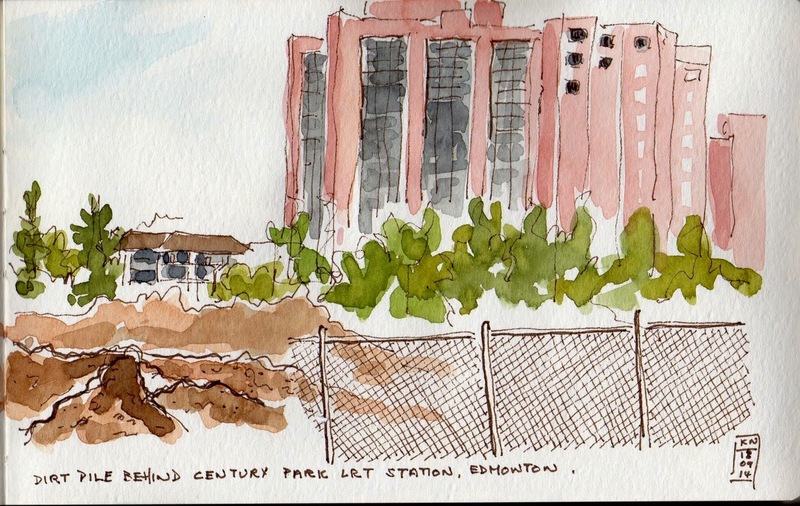 In mid September I noticed this huge pile of dirt behind the Century Park Train Station in my neighbourhood and thought it was the start of a new block of apartments being built by Procura Real Estate Service (developers of Century Park Condominiums). It seemed an interesting project to follow in sketches. A few days later on 22 September, the Edmonton Journal reported that ProCura was "storing" the pile of dirt for a construction site across the road. 100 complaints about the dust from the dirt pile (which had not been watered) came from residents in the area. The City of Edmonton threatened to sue ProCura $400 a day for this illegal use of their property. Residents in the adjoining pink apartment complex (what seems to be a landmark in this part of the city) must have been the hardest hit by dust. 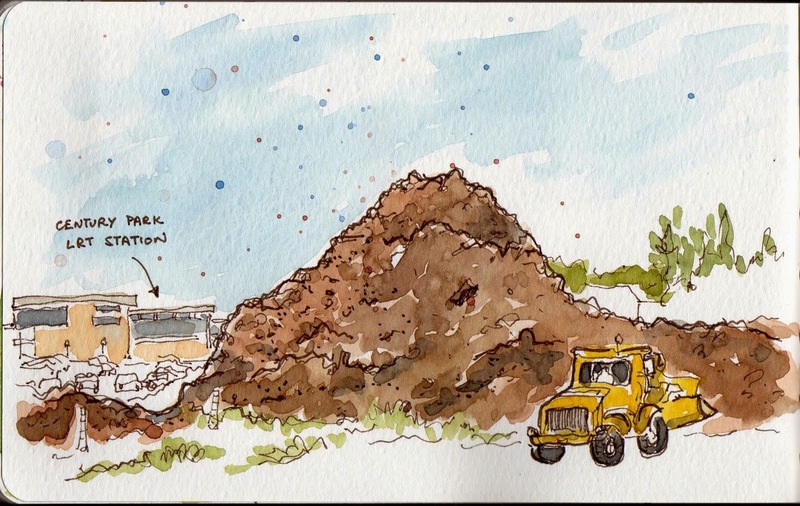 The threat seemed to work for on 10th October when I sketched the dirt pile again, it was a third the size of my first sketch. Three days later it had been completely removed. 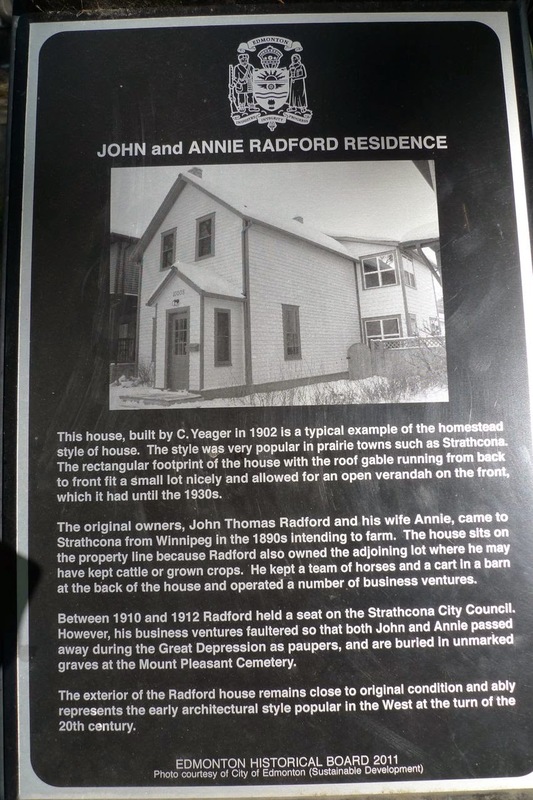 PS the development across the road where the dirt came from is Shepherd's Gardens Heritage, a new seniors' apartment complex on 109 Street. This seniors complex is to have a rooftop dining room! 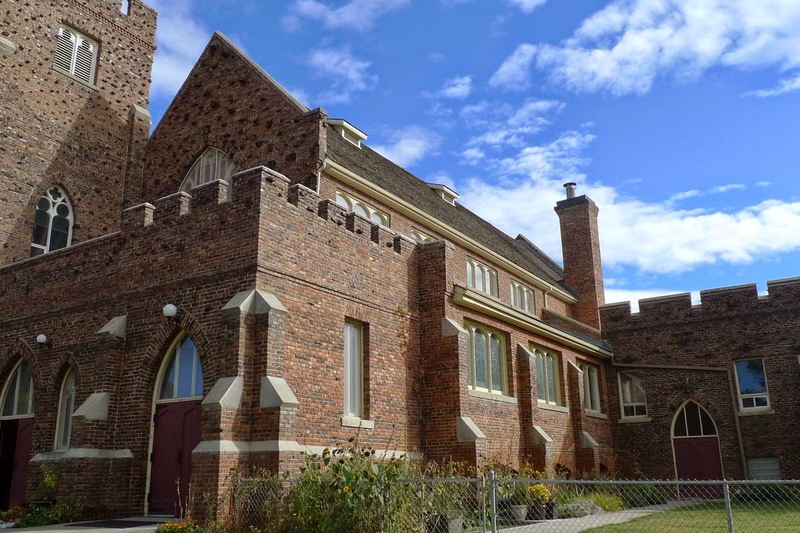 This church in the heritage neighbourhood of Old Strathcona in Edmonton was officially opened in 1913. 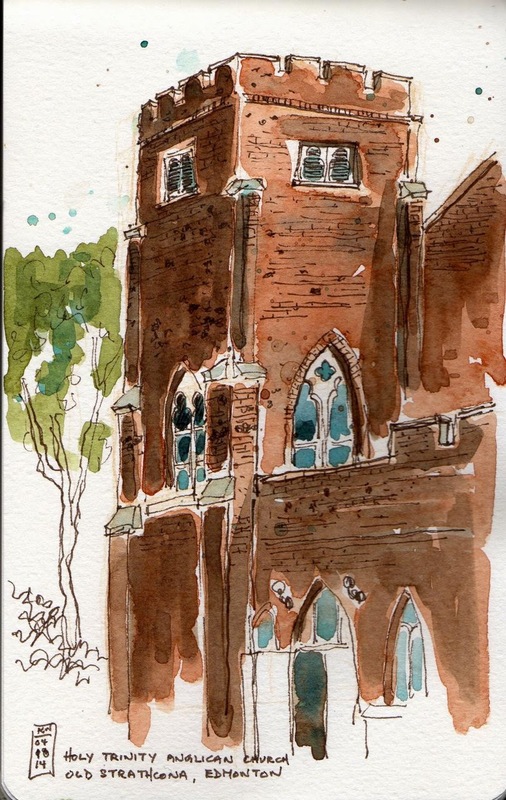 Built in the Gothic Revival style, the clinker brick cladding gives it an interesting mottled surface. 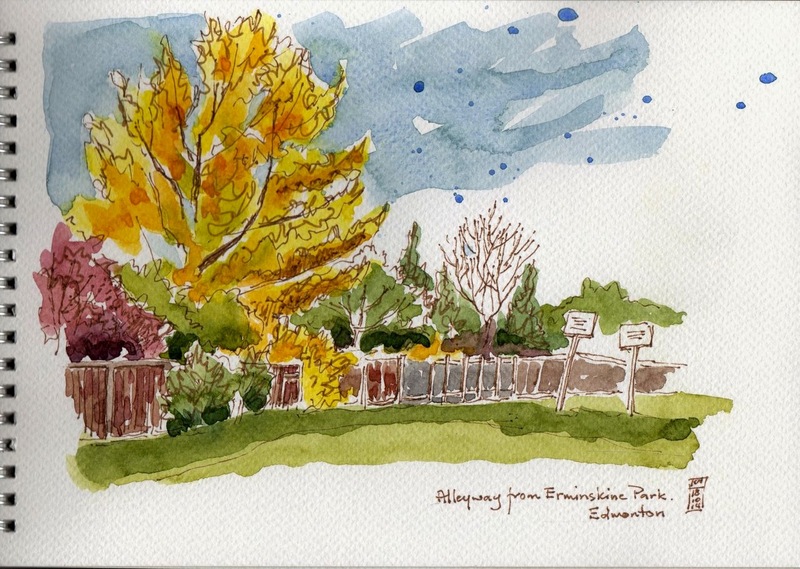 This was sketched and coloured with watercolour during the October Sketchcrawl with the Urban Sketchers Edmonton group. What a treat to have a warm day so we could still be outside! 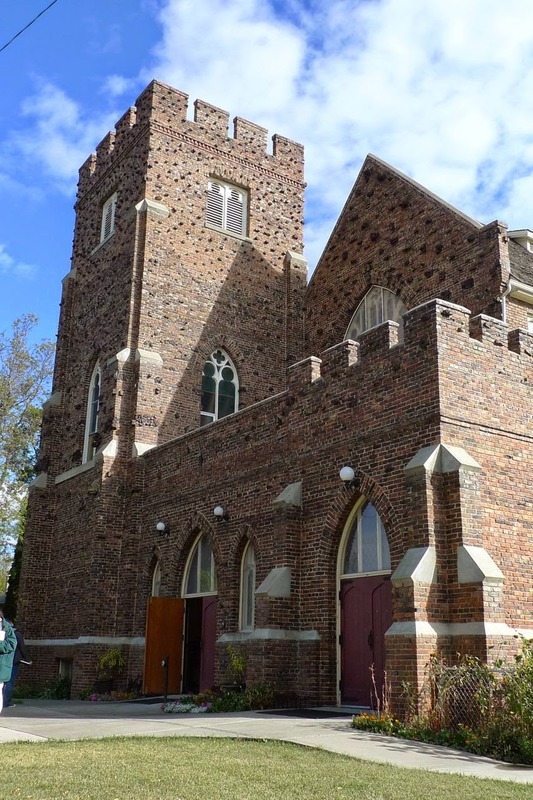 For more on the history of this church, click on the link to Holy Trinity Anglican Church on the Canada's Historic Places website. 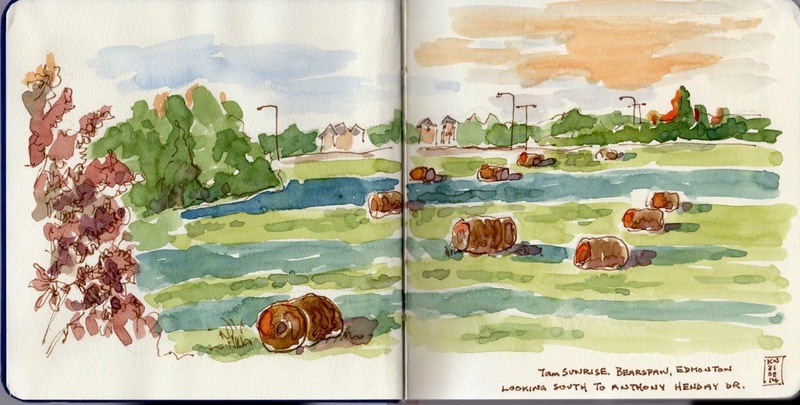 Sketch of a rather pleasant green space in the Century Park condominium complex in our new neighbourhood. 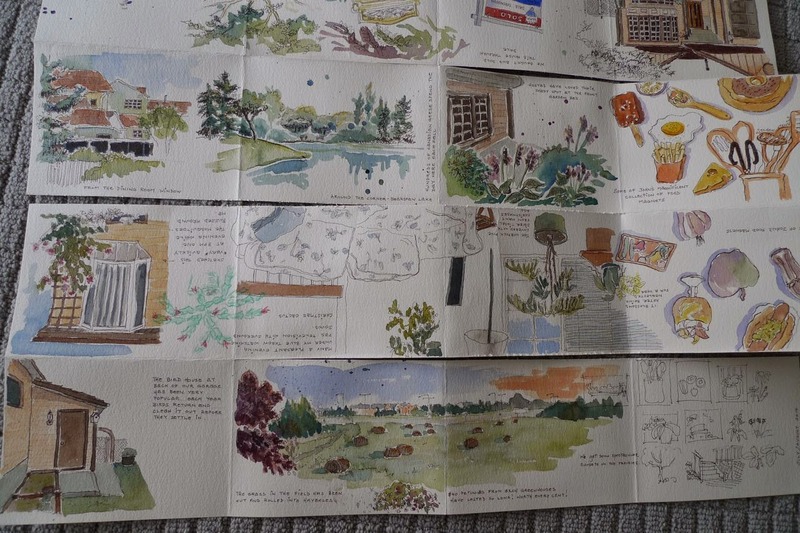 Before we moved from our old house I sketched scenes in and around the house in a home-made folded journal (made from a piece of folded watercolour paper). 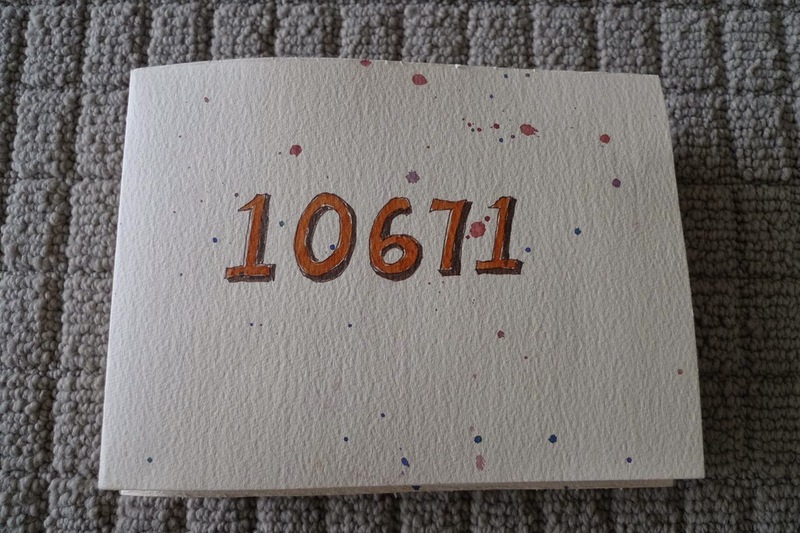 The 300 gsm (140lb) paper makes it stiff enough not to have to add a heavier cover. 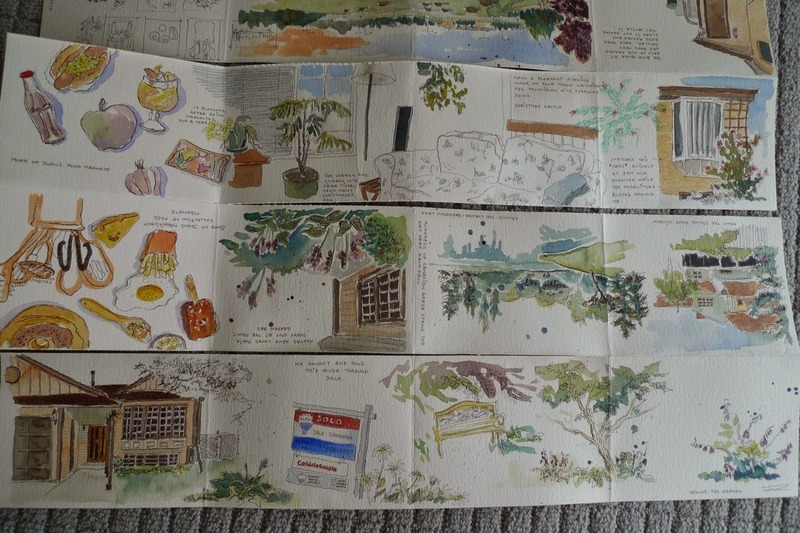 I probably would not choose to use this beige coloured paper ever again as it made the whole thing dull. 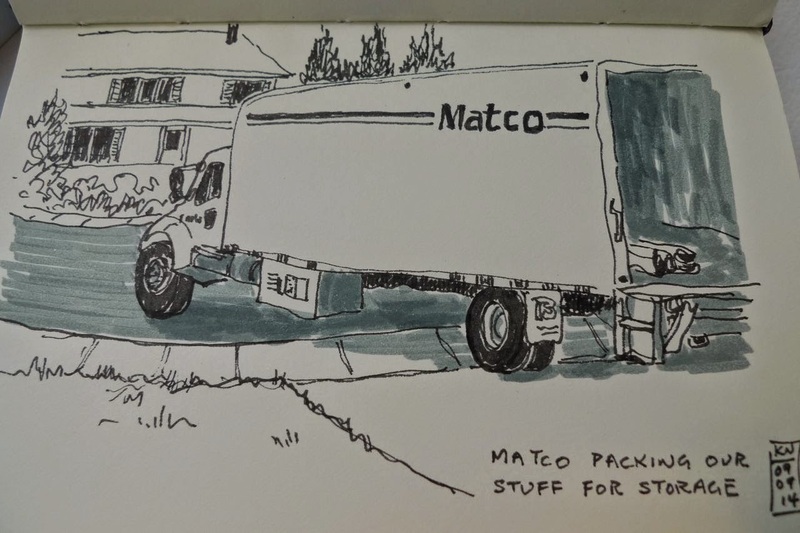 Almost forgot this sketch I managed to fit in on moving day. 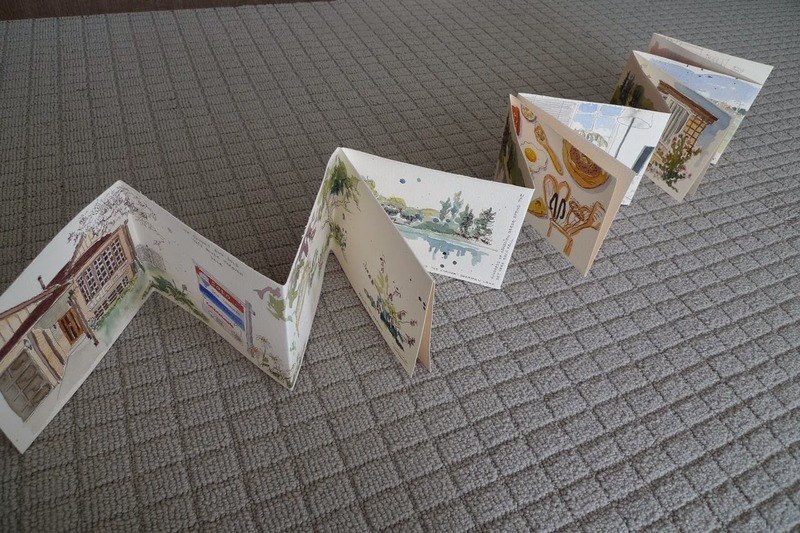 For more on how to make a folded journal, check out Cathy Johnson's video. 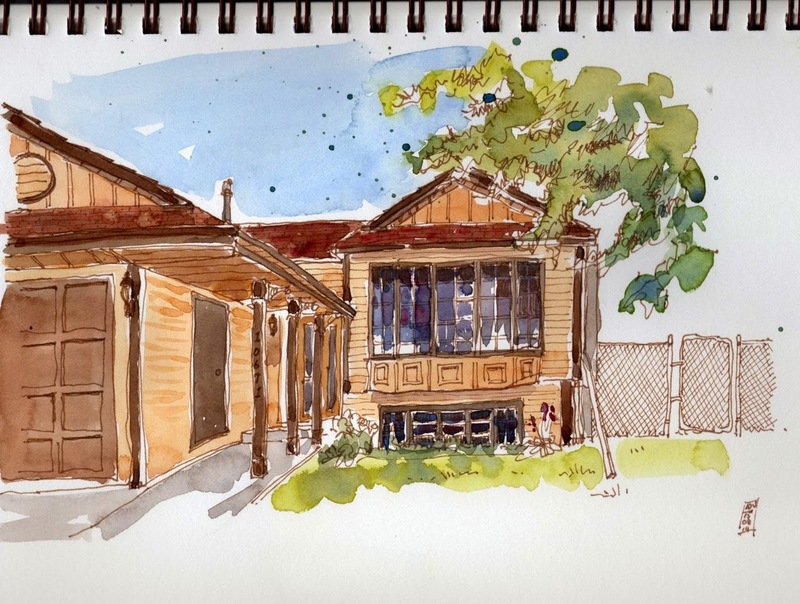 The September 2014 Sketchcrawl with Urban Sketchers Edmonton was held in the historic neighbourhood of Old Strathcona. 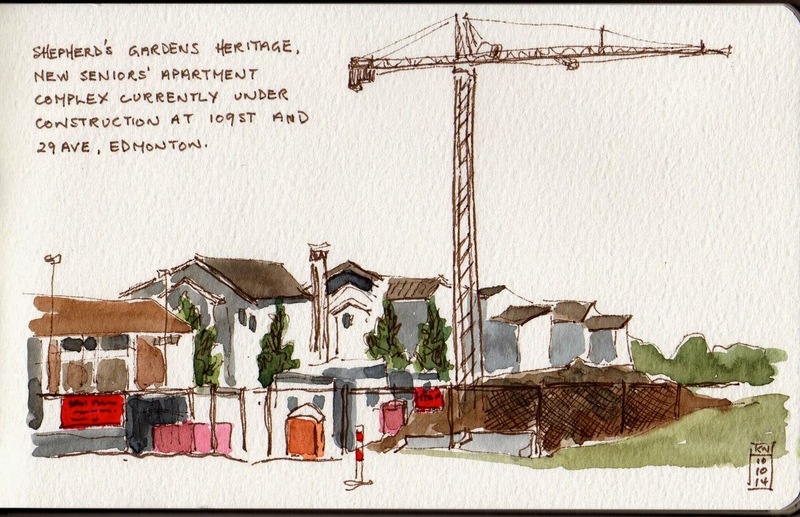 I sketched a heritage house with a plaque outside (one of many in the area). I understand any renovations to such homes are subject to strict regulations to preserve the original style. 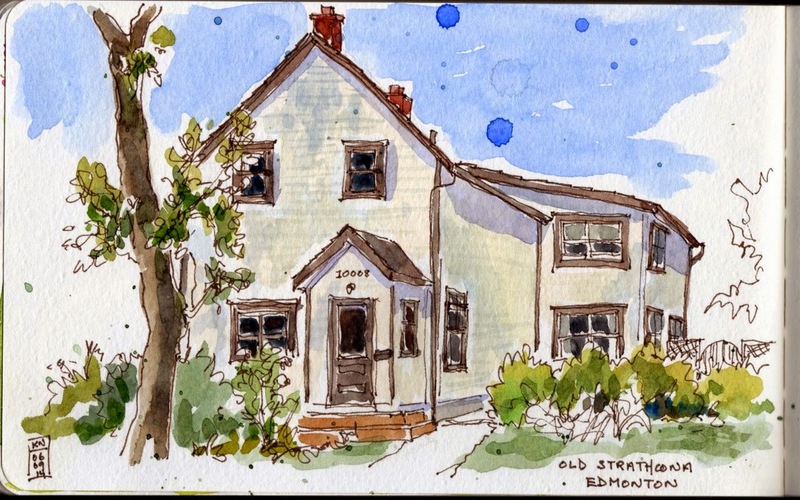 Old Strathcona developed on the south side of the North Saskatchewan River (the river which flows through the city of Edmonton). 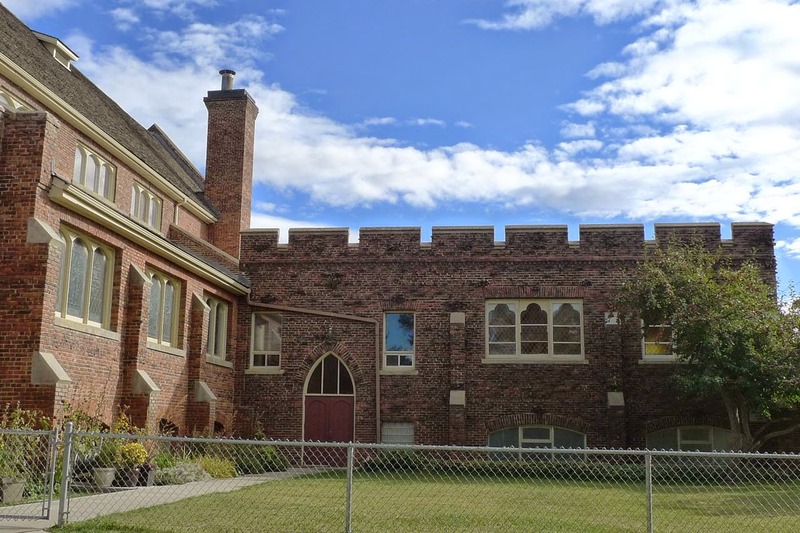 It was the northern terminus of the early railroad and overland routes from Calgary. Today it is an area of trendy small shops and cafes located mainly along one long street (Whyte Avenue). It's a popular summer hang-out. Don't forget, Edmonton is a winter city and most shops are in malls. We sold our house recently and downsized into an apartment. It's something that most people our age think they *should* do but can't quite get round to doing. I like the way friends our age look at us in awe like we should get a medal for bravery. 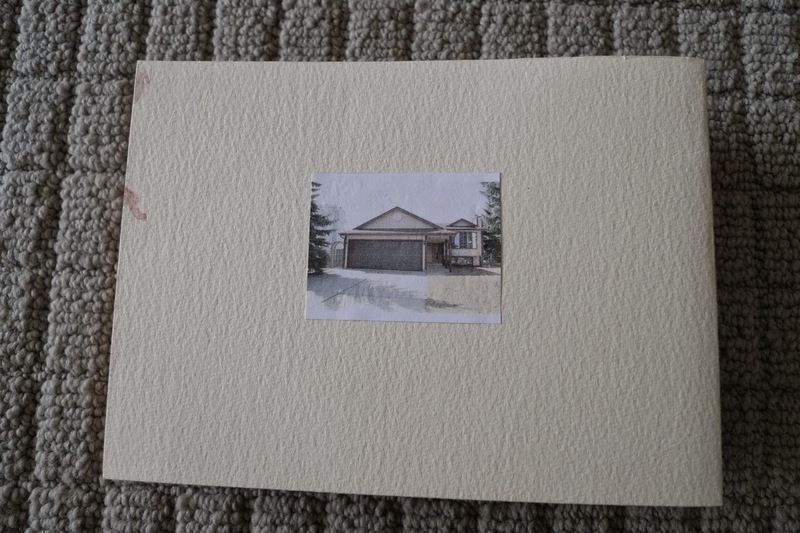 After 12 years in the house I had some mixed feelings about the move and my husband more so. He likes to hang on to old possessions and we had to get rid of A LOT of "stuff" to achieve the move. 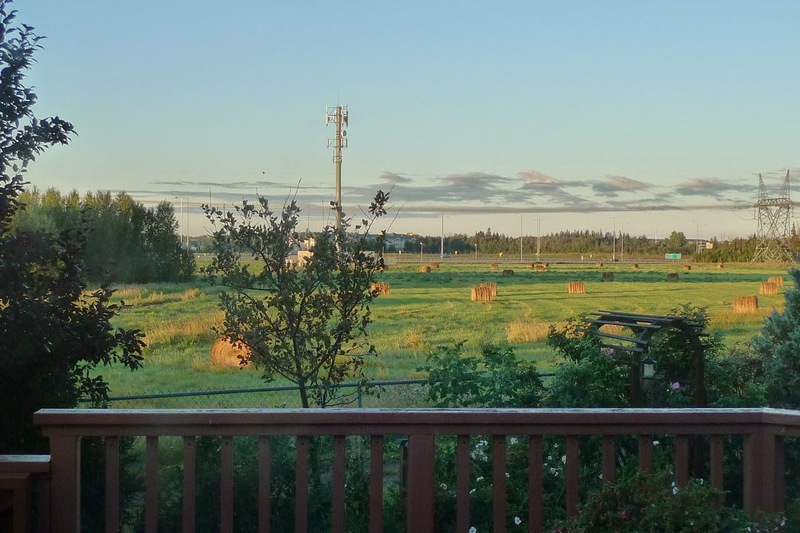 We'll miss the spaciousness of the old house and in the Fall we'll miss the hay bales that get made from the cut grass in the meadow behind the house. But hey! No more creaky old house...and no more snow shovelling in winter! Yay!!! Hay bales behind our house. A little tractor comes and mows and the contraption in it's rear compacts the dry grass into bales. It gets taken away and sold to farmers. The meadow behind the house.